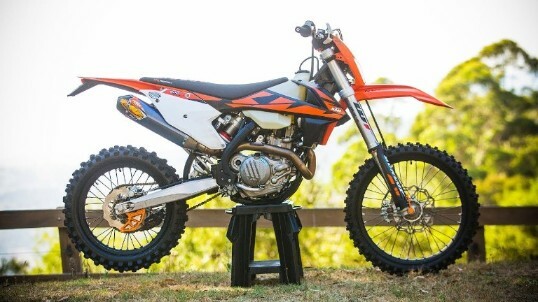 The KTM 500 EXC-F could be called the ‘Alpha Male’ of the dirt bike world. It is an absolute powerhouse. The decision to go big-bore or smaller capacity is a tough one, you really need to look at the type of riding you will be doing. KTM has a bike to suit just about any rider. Here’s an overview of some of the improvements for the 2018 model. State-of-the-art Keihin engine management system with electronic fuel injection featuring a 42mm throttle body. Six-speed transmission features a special surface treatment on 2nd, 3rd and 4th gears for improved reliability. 310mm of rear suspension travel and 300mm to the front. An improved cooling system which routes the coolant from the cylinder head, through the frame triangle and directly to the radiators. New radiator protectors which help heat dissipation, and also add protection. Improved WP Xplor 48 forks and PDS rear shock absorber. New outer fork tubes carried over from the SX-F models. Brembo brakes and hydraulic clutch remain from the 2017 model. 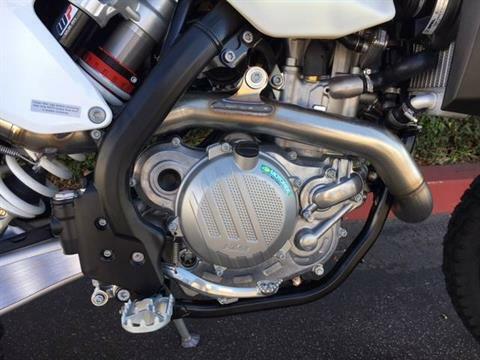 Improved airbox design which gives easier access to the multi-directional filter cage. No tools required. 8.5-liter (2.25 Gallons) opaque fuel tank with an integrated fuel pump. ODI lock-on grips which make things easier when replacing them. There is no kick-starter, which is going to be a thing of the past soon with new advanced technology. Sophisticated ‘No Dirt’ footpegs prevent jamming up out on the trails. The 63hp engine is more than enough to scare yourself for sure. With all that power the corners come up pretty quick, but it’s a manageable power. The six-speed transmission has a ‘clever gear-sensor’ which adjusts the engines power delivery to the selected gear. 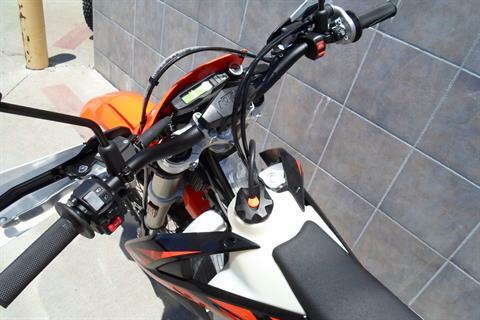 KTM’s PowerParts catalog provides a traction control and mapping switch for the entire off-road range, which can be purchased separately and fitted easily. On a big-bore four-stroke, this makes a big difference, allowing you to quickly tame the power on the tighter trails, reducing your fatigue levels. The fuel injected powerhouse is the most compact and lightest on the market. In 2017 the bike was completely redesigned from the ground up, so this year it was all about making a few refinements to make the EXC-F that much better. The engine was made more compact, which has allowed the frame and chassis to be made smaller as well. This has allowed the engineers to bring everything closer to the center of the bike, centralizing its mass and improving the handling. This improvement is more noticeable in the 500, being the heaviest of its siblings at 106.5kg. The Chrome-moly steel central-tube frame has also been improved to provide better absorption and flex which helps limit rider fatigue. The suspension has received a few minor changes on last years model to improve the performance and handling of the bike. 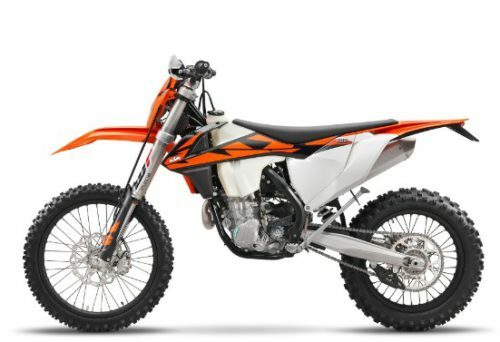 The PDS is a trademark of KTM where the shock absorber is directly connected to the swingarm, as opposed to the linkage system used by other manufacturers. This setup gives the best possible mounting geometry and progressive damping. The shock is mounted close to the centerline which places a nearly symmetrical load on the swingarm and frame. The WP Xplor upside-down fork is a split fork system developed by WP and KTM, which features separated functions for each fork leg. Compression damping is fitted on the left side, and rebound damping is on the right. The compression and rebound adjustment can easily be done with a twist of the dial on the top of each fork. The 48mm fork has approximately 300mm of travel. The NEKEN tapered high-strength aluminum handlebar setup features an ODI volcanized grip on the right, and on the left a comfortable lock-on grip which requires no glue or wire to secure it. The Australian Tatts Finke Desert Race for 2018 was a clean sweep for KTM, taking the top 3 places in the bike section, all riding 500EXCs. Winner Toby Price won his sixth ‘King Of The Desert’ title, second place was David Walsh and third was Jack Simpson. 2016 was also a clean sweep for KTM 500 EXCs again taking the top 3 places, Toby Price winning, followed by Tye Simmonds and David Walsh. 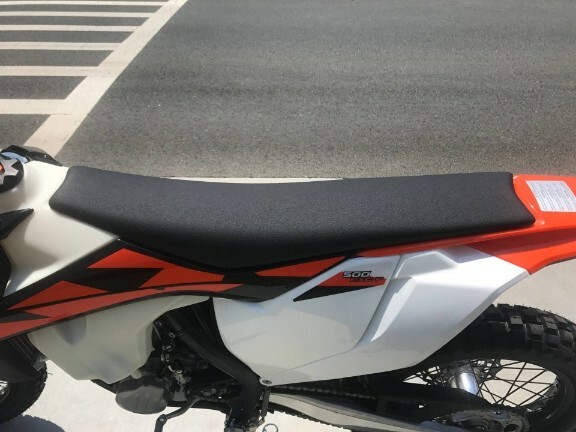 The 2018 KTM 500 EXC-F is in a class of its own and the only bike that comes close is the Husqvarna FE 501, which of course shares many parts given that it comes out of the same factory. The overall finish and feel of the bike is first class, which is what we have come to expect from KTM. At only 106.5 kgs it handles brilliantly, and the suspension is superb. KTMs off-road lineup has made the Austrian company the brand to beat over the last 20 years. KTMs success is unprecedented, and bikes like the 500 EXC have put the brand on the podium more times than you can count. Whether its desert races like the Dakar Rally, the Baja 1000, Tatts Finke or enduros like the GNCC, Red Bull Romaniacs or Erzberg Rodeo, KTM has had victories. The companies tagline promises “Ready To Race” right off the showroom floor. The KTM 500 EXCs were the bike of choice in the Motology Films MOTONOMAD trilogy. Adam Riemann chose to use competition enduro bikes rather than a heavier purpose made adventure bikes to complete a 7000km trip from the KTM factory in Austria to Egypt. What’s your favorite KTM model, the big-bore four-strokes or the lightweight two-strokes? Please feel free to share your thoughts with readers below.